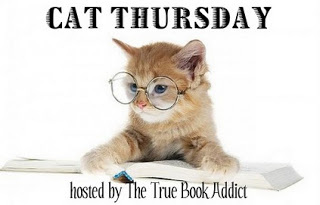 Musings of a Bookish Kitty: Cat Thursday: Attack! Kathy - Is she? LOL I had just gotten my hair done at the salon, so I wouldn't be surprised if she wasn't happy with my 'do. LOL kitty attacks can be cute, when they're not painful. These made me laugh so much. When you see how they treat their brothers and sisters, you know it must be love. Kate - :-) She is such an affectionate kitty. Oh my goodness, that cat was having a good time. :D I hope you didn't get too clawed up. Hahaha! That is hilarious! Kitties do love getting in our hair. Diane - It was quite funny at the time too. Haha! I am okay. Worried about my Parker, but okay. Michelle - Luckily, yes. LOL But I had to check a mirror first to be sure.